It’s a great practice tool! It’s not a back up band to use in your home studio recordings. It is for you to practice your soloing on your instruments or see and hear chord theory for accompanying a lead. It’s an excellent app. It’s not for great sounding virtual instruments. The instruments sound good enough, but this is about you practicing and learning music, not for the quality of the instruments themselves. Awesome and limitless as far as potential for learning & studying music is concerned! I waited to review this app to see how I’d like it and it’s functions. As a beginning musician trying to learn guitar in later life and never having learned any music/instruments you I’m not sure you will find a better tool. Takes a little time to learn how to use the app effectively, but I have found the app to be extremely flexible and helpful. Completely worth the money. This app is a nice idea, however the execution is very confusing. It is very difficult to organize the songs that you want to keep and the songs that you want to practice. Also, as usual, it is difficult to understand instructions that are written in pigeon English. Solid Playback, compositional accompaniment and practice tool with multiple applications. But doesn’t come with any music but there’s a great form or you could download the court changes to thousands of popular tunes and experiment by changing the styles. It’s like band in a box, and someways more versatile, but with less tweak ability in regards to the accompaniment. 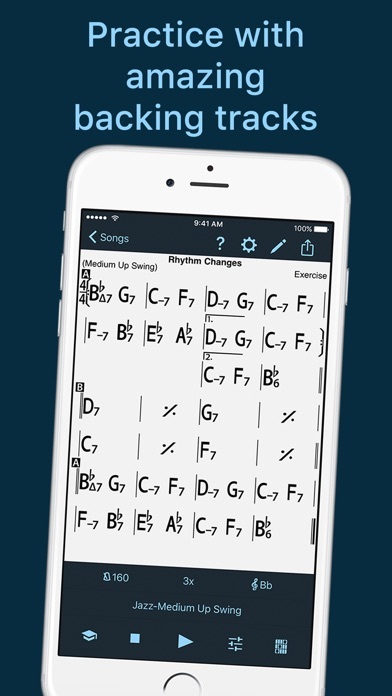 If you want to gig and you don’t know key changes, this is the app to have. I’ve seen so many professionals with them. You can also export midi, and whatever style you want. It’s help me to compose new songs. The interface is a little tricky, but there’s plenty of tutorials and helpful for him literature, as well as templates and options. This is probably the most comprehensive tool of its kind, and although there’s no real audio, if you’re not happy with the sounds of styles, export the midi, or if you like what you hear you can export the audio. For example, I found a tune template with some key changes I liked. Tweaked and changed some of the form and chords with ones I was hearing. Changed up the style. Wrote the developers and ask them if they could add an option to record. Not only did they respond, they did. Unbelievable. That was five years ago. There are still regular updates... it and it is absolutely a go to app that is One killer practicing, especiallyif you are a student of jazz, Bluegrass, blues, this will help you gain levels. I even use it on gigs if someone has a song request that is too obscure to find a backing track. It’s all about just getting from Milyer with the controls. Being tasteful and thinking creatively. It also is a plus, having the technology on hand to stream Bluetooth audio. Great as is. Encourage further development. I’m a jazz snob. This app is perfect for me since I am learning jazz piano. It is also very good for composing and even recording a tune with other instruments, PROVIDED, one uses the midi out file transfer. The internal sounds are okay for learning but not good enough to record with. That’s okay because with a midi file player and multi layered sample based apps one can can obtain a very decent recording. I encourage the developer to consider further enhancements such as more comping styles, chord inversions, additional drum fills and practice tunes " in the style of (artist)". BTW, I have all the Session Band Jazz apps and this app has them beat. Great job! Love this app! My ONLY suggestion for improvement would be to make it so that the note velocity in the chordal instrument have a little more of a humanistic quality. Maybe make each note velocity, or even whole chord velocities, be a little varied. Everything hammers at the same volume now, which is pretty mechanical sounding. Don't know how you'd achieve that. But if you did, I could gig with this! Every song in the book available at your fingertips. I love this app. It makes short work of the grind musicians have had to bear for so long. A million thanks to iReal Pro for bringing this type of program into the 21st century. BIAB switchers...what are you waiting for? Best in class! Great App. Upgrade tech needs a fix. This app essential to my work as a musician. I do not upgrade the app because I lose all my playlists when I upgrade the app. The companies fix for this “is download your Play lists and re-enter them into the app after you’ve done the upgrade. This should be fixed. If you do not do it correctly you have to rebuild all your playlists. If you are somewhat technically challenged as I am it’s gonna be a problem. What an amazing app! I can easily write (or use prewritten) chord progressions to create backing tracks that sound great and are excellent to jam with. Changing styles, tempos, and key signature is also extremely easy. The only thing missing from this app is an, “infinite repeat” function so I can jam for hours in end without pressing start when the repeats eventually come to an end. Right now repeats are limited to 30 times. What a great program. I am a journey jazz musician. Work and life jammed me up for the past year. Back in the shed and using the program again and man has it improved. Not only do I get the changes every time they change I get a list of note changes. That is so sweet! Thanks for taking care of the little guy. If you ever used band in a box and have wished that it would run on your phone, then here you are. Personally, I love this app and use it way more than I ever used band in a box. It has an easy to use interface. 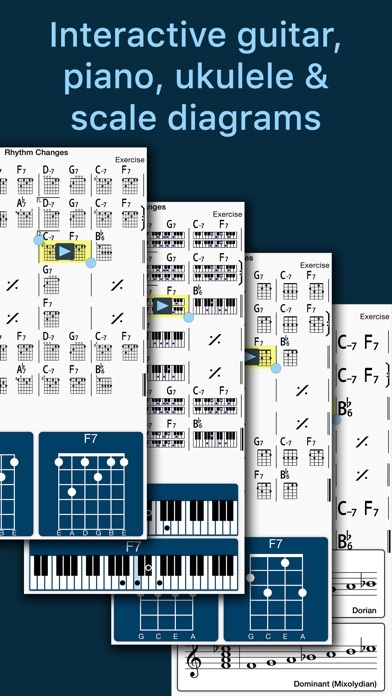 You can create your own chord charts, and play along in any key with dead simple transposition. The backing track sounds are great, and the forum community is full of songs to download too.There are many backing track styles to choose from, and it is easy to organize your songs into playlists for gigs. This is a Swiss Army knife of practice apps! Well worth the price. In fact, I would pay way more for this app and still be very pleased. The developers are responsive to feedback, and the app just keeps getting better and better. Great work!!! Oh I love this app. I have the iPad Pro and my entire band has this app. We share charts quick and easy. We’re all on the same page at the same time. We even pull up songs people request right off forum. Make a key chanting a flash. I tour around the globe and would not leave home without it. It’s a musicians bible 😀 Five thumbs 👍🏾👍🏾👍🏾👍🏾👍🏾 Could a number system : hint hint. This is the perfect training tool and it is a great play along. I have even sent the midi to Band in a Box. IReal Pro is great for the professional and novice. A wealth of musical knowledge! Well worth the money! This app is a masterpiece sent from the heavens. My practice would be so empty without it. Wow, what an app! Easy to use, excellent for practice and live performance. Just connect it via Bluetooth and done. I use this app on my iPad and on my phone. I love it. I can’t remember what life was like without it. This is a great app for jazz musicians. Wish I had this back in music school. for any student of Jazz (or professional), this app puts the whole world in the palm of your hand. Five stars! I still love the app for practice and for organizing my own lists. But ever since the latest iOS update, the option to share a list in the iReal format doesn’t work. That was one of my favorite / most useful things about the app, so I hope it gets updated! Helpful app but I purchased this on my iPhone which transferred to my iPad. Unfortunately, my MacBook and iMac won’t recognize my purchase and keeps prompting me to pay $19.99! If I had of known, I would’ve purchased on my computers as I use those more for practice. A marvelous app for jazz practice, and the customer support is outstanding! There’s a lady in app support named Niki who is especially helpful and knowledgeable. Highly recommended! If you’re a jazz musician, you need this, period. Frankly, this is an essential item for any jazz musician. An incredible work, play, practice tool that continues to get better each update. It’s amazing. Buy it. This is an outstanding, and probably the best one available for the purpose. It is extremely flexible and I have added several of my own tunes. Also, the support is prompt, helpful and accurate...and prompt. No more than 24 hour response time. Every musician needs this app. 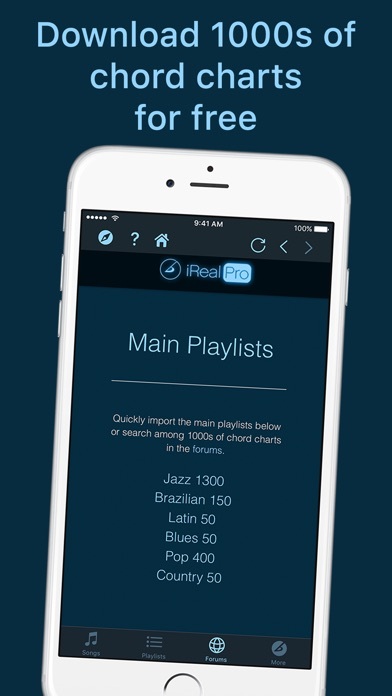 Ireal Pro - If you don’t have it, you NEED it. 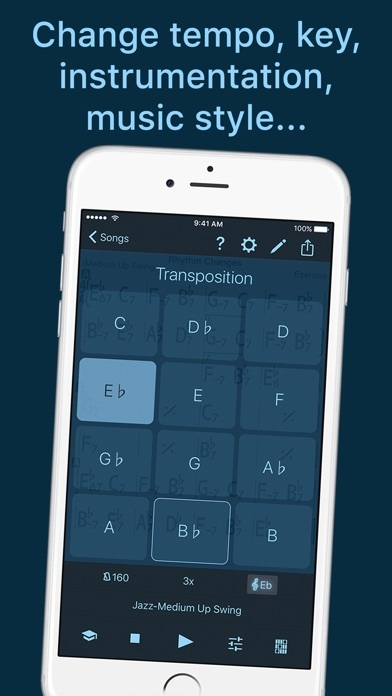 If you are a musician at any level, this is the app for you! Imagine being able to practice any of hundreds and hundreds of INCLUDED songs at any tempo and in any key. Any number of choruses. Ability to select the rhythmic style. Ability to select the instrumentation of the rhythm section. Ability to dial rhythm instruments up or down - or out. 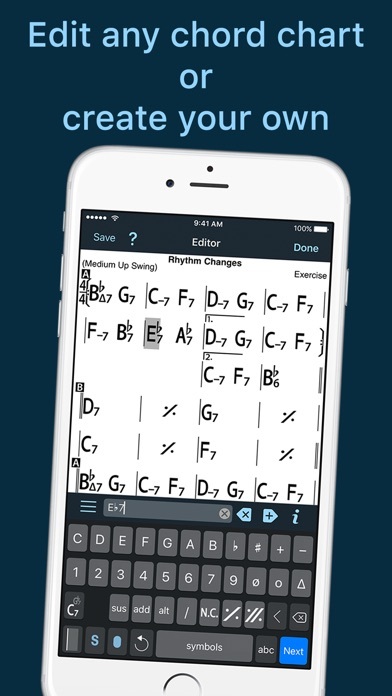 You can even enter your own song chord changes. It’s not just a practice tool. You can hook your phone up to an amp and perform in public with this app. Make playlists. This is one of THE most well designed, well maintained and useful apps anywhere. Not intuitive. Come on! Fix it already! This app is incredible. I play Jazz so this is perfect for having chord charts, making practice exercises, and a whole lot more! I feel like the add on for pop and blues is pointless though, other then having a chord chart all the tunes need a melody to even sound close to the original music. I feel like working with an actual metronome would be more useful to a beginner player. An aspiring Jazz player NEEDS this app but two chord chores and weekend players might want to look elsewhere on ultimate guitar tabs or something. You need to improve the sounds.... When I hear your system... just maschine.... Your sound is not instrumental sound... Fix that all please.... And you need more mixing tracks... There is a lack of mixing instrument.... We need more complicated music,,,,!,, We do not need many styles.. it is enough now!,!! Do not make more styles... just improve sound quality!!! And bountiful sound we want!,!!!!! I wanted to download specific jazz standards to play and sing for a gig and be able to transpose them easily... this app is confusing and not user friendly, for $13 I’m very disappointed with the format. Could someone direct me to a more stream lined Real Book only app?? This is my 2nd review. Prior to this, I rated iRealpro 5 stars; now I like to change that rating to 5.5 to 6 stars. I love all that is possible with iReal. However, when an issue came up I submitted the problem in the evening thinking the response would get to me within a day or two. Instead, when morning arrived upon waking up, there it was; the answer to my question. Many thanks to the iReal crew. Any musician who wants to learn theory or just play and have fun this is the app for you. I love it and it’s helped me become a much better player. Devs: Please keep up the good work!! I’m 4 years into committed practice of jazz bass guitar, and I truly don’t see how I could pursue this path without my iReal Pro. My daily practice routines ~ scale and arp cycles to chord sequences to songs ~ are fully dependent on practice tracks. The app has so many settings, I can’t really see what couldn’t be practiced with it. Ok there’s probably a way for an adult non-genius with a good teacher and method to learn to play without iRealPro, but I can’t think what it is. The charts are often incorrect and usually only one version is available. It’s better than nothing but it used to be better! I wanted to use this app for my iphone, but I accidently bought it on my Ipad, since every app I buy on either devices it allows me to open them on both devices since I’m using the same account, is there anyway I can change the app from the Ipad to the Iphone? It really doesn’t work for me on the Ipad. Sorry for bad english. Great tool for jazz guitar practice! I really love how easy this tool is to use when practicing jazz guitar. What more can be said about your inane whining and stupidity concerning this app? I have been using this app for several years now. It’s useful for my drum practice, bass practice, vocal practice, songwriting. How one chooses to use this as a practice tool: the sky’s the limit! The online community is amazing. I can have friends come over and I mute their particular instrument along with mine.I am learning bass as my second instrument and this program is invaluable. I can slow down anything to a manageable Tempo so I can explore the chords deeper. I can pick up even esoteric jazz and pop songs with the incredible online community. I do not need to be connected to the Internet to play downloadable songs with this software. I use it to also practice vocal exercises. It also exports charts to PDF which is fantastic if I want to play or share a chart with the actual song audio. One of the best purchases I’ve ever made from my iPhone and iPad. They say Time magazine voted this One of the 50 best inventions of 2010. I say it’s still one of the 50 best inventions for musicians and it’s 2018. Thank you developers! This app is a no brainer, must own app for all jazzers. Indispensable for learning new tunes, and, if craftily used, can pop up in some gigging situations (shhh). I already own the the app for my iPhone but it is not easy to practice while making sure that your screen doesn’t turn off. I decided to install it to my Mac Pro but apparently you need to pay additional $20 for the same stuff. This is a great tool for practice or performance. Takes a bit of time really learn to use it fully, but well worth the money and the time. I’ve been using this app for years, and it’s been great, but there are 3 things this is missing. 1.) Sharing charts via text. 2.) Writing In off beat hits. 3.) MINOR 13 CHORDS.